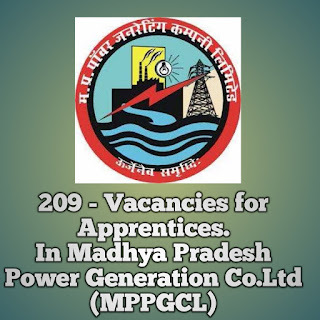 Madhya Pradesh Power Generation Co. Litd (MPPGCL) recruitment - Vacancy of 209 Apprentices. Recently Madhya Pradesh Power Generation Company Limited (MPPGCL) has declared a recruitment notification for the Vacancy of 209 Apprentices. Interested candidates may apply online from 08-12-2018 to 31-12-2018. Educational Qualification: Graduation/Diploma in Engineering ,Technology, ITI. Selection Procedure: Written Test + Interview. candidates may apply online by MPPGCL website - http://www.mppgcl.mp.gov.in/ - from 08-12-2018 to 31-12-2018.